Bring in the dimensions of your kitchen or bath for a free consultation and find out how simple it is to uniquely beautify your home. 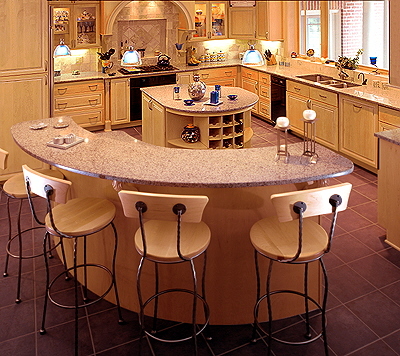 A full-service supplier of natural stone products. Specialists in fabrication, installation and maintenance for all of your applications. How can natural stone increase the beauty and value of your home? Stones have color, depth and quality that cannot be duplicated by any man-made material. Natural stone is made up of minerals that have crystallized in the earth’s crust throughout the ages. Once a sheet of stone is cut and finished, the unique colors and patterns of these minerals take on a three-dimensional brilliance. Call (216) 241-0220 today for a free consultation and estimate. The natural beauty of stone also endures for the life of your structure. Natural stone is fade, stain, scratch and warp-resistant, will endure the weather, withstand heat, and provide low-maintenance care. At Cleveland Granite and Marble, you can select from granite, marble, slate, limestone, or quartzite depending on the design and structural characteristics of your application. Find out today how easily natural stone can add timeless elegance to kitchen and bathroom counters, fireplaces, flooring, paneling, furniture and more.